Is financial independence new slang for an old and overlooked psychological theory? The theory I'm about to discuss is an enormously helpful scaffold for anyone thinking critically and creatively while approaching life differently than the majority of society (hence its obvious application to FI). If the above lyrics resonate with you, you’ll enjoy learning about an idea developed by Kazimierz Dabrowski called the Theory of Positive Disintegration. It's an underrated and life-changing system for analyzing personality development. To begin with, Dabrowski was a contemporary of Abraham Maslow. His theory was developed around the same time. However, it didn't become as popular throughout history for a variety of reasons discussed in the final post of this eight-part series. After visiting this site, I hope you walk away understanding the theory better so you can look at your life and the lives of those around you in a different way. Maybe you'll even look at song lyrics, the media, and the people you choose to bring into your life in a heightened way. Most of all, I hope you experience art, music, and other forms of creativity as allies assisting you with the challenge of developing a self-chosen and self-aware personality that contributes to the world. Before diving deep into the theory, I suggest you check out this short video for an overview. Also, in order to understand the theory thoroughly, we have to tackle some frequently used key vocabulary. Let’s start with my personal favorite. Are you rejecting societal expectations and paths laid out for you? Are you pausing to think very critically about your real options? Are you arguing in your head with anyone who says “it’s just what people do” or possibly “it’s the way it has always been done” even though you're not the argumentative type? Are you breaking down every choice in your life (from your friends to your peanut butter) in order to consciously set out on a mission where high values and high standards matter (even at the risk of social isolation, rejection, or misunderstandings)? Congratulations. You might be maladjusted in a way that is deemed “good” for personality development. This book explains TPD and positive maladjustment very well. It also focuses on our next concept described below (overexcitability). Imaginational - Do you prefer the unusual and unique? Do you have a vivid sense of imagery, a richness for random associations, and enjoy dreams (even daydreams)? Do you fill your day with future ideas and inventions? Did you have imaginary friends or give personalities to inanimate objects as a child? Intellectual - Do you view the search for truth as central to life? Do you thirst for knowledge in an intrinsic way? Do you prioritize theories, discoveries, and analyzation? Do you question the background conclusions and motives of everything and everyone? Emotional - Do you experience an often confusing and wide range of feelings? Can you experience profound happiness and profound depression almost at the same time? Do you strive to responsibly express these emotions with self-analyzation? 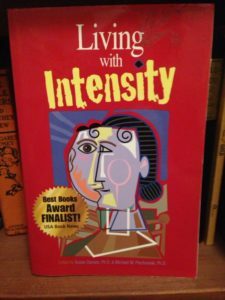 Do you document your intense emotional life in some introspective way (journaling, art, or songs) in order to not have it not interfere with your relationships? Should you? Psychomotor - Are your days filled with movement? Do you demonstrate a restless vibe by always moving on to the next thing with little time for a break? Are you generally active, energetic, speaking with your hands, and looking for an excuse to get some built up energy out of your system? Sensual -Do you feel small changes in temperature, need sunglasses when others don’t, startle easily, or have enhanced sensual experiences? Do you feel the environment around you in a heightened way? According to TPD, if you said yes to many of these questions, you come with great “original equipment” for the climb to a unique and integrated personality (or the climb to FI in my opinion). Overexcitability is a very important concept and could be a book in itself. Heavily related, Elaine Aron wrote a book called The Highly Sensitive Person that outlines high-sensitivity in terms of evolution (and how having 15% of any population extremely sensitive - animal or human - benefits the survival of the species). To me, her theory fits right in the pocket of Dabrowski’s TPD. What is your individual capacity to refuse blind adaptation to society? In other words, how far do you think you can you go on your own before relying on a societal groundwork to fashion your vision of an ideal life? Most importantly, what energy have you harnessed for such a task? According to the theory, three overexcitabilities mentioned above (imaginational, emotional, and intellectual) are needed. Manifesting your potential depends on your ability to identify these in yourself, know yourself well, and most importantly - decide to engage and act on your differences. Dynamisms are forces within that act as tools for transformation. A unique personality aligned to high standards of moral character is the ultimate goal of positive disintegration. Different dynamisms appear at different levels of this theory to help a person reach that goal. When the individual senses them and uses them, they can effectively navigate that level. This is where my analogy to video games comes into play (from someone who doesn’t really play video games). The Mario Brothers are given different powers at different levels, right? The boomerang flower, Yoshi's wings, the coin box, the 1-up heart... (OK, I remember quite a bit from my kool-aid drinking, basketball playing, video-game infused summers). Personality is derived from biology intersecting with the environment. According to TPD, there is a third factor existing outside of the nature (1st factor) versus nurture (2nd factor) debate. It is a third element where the individual takes control of their own development by actively controlling the influences in their environment and responding in a more conscious way to events. It enters at level three of the five-stage theory. Unilevelness - Levels one and two of the theory exist at this level of consciousness (for lack of a better term). An individual’s problems are recycled and keep showing up because they deploy little inner reflection and lack intrinsic introspection. Mulilevelness - An individual is launched into levels three, four, and five if their developmental potential is high enough. They analyze recycled problems with considerable intensity and self-criticism. Dabrowski (the creator of the theory) emphasized the importance of contemplating a hierarchy of values. In level three, the hierarchy of values may dominate a person’s thought process until they see "the higher and the lower" everywhere, in everyone, and in all actions almost all the time. Artistic expression and spontaneous creating become about the only way to deal with it. Level 3 - Strong vertical tension exists between the higher notions and the lower notions in oneself. Extreme disappointment in the self takes place when an individual is “tugged down” again. Level 4 - A strong mission in life enables the person to act on his or her’s self-constructed ideals. Their hierarchy of values has been extremely articulated with the assistance of the creative process and the person can move onto things other than looking for the higher and lower in themselves and others all the time. Level 5 - Inner peace dominates due to immense inner knowledge. An outer connection to humanity, life, and general awe is expressed through service. Sounds nice, doesn't it? If you reach level five, please track me down on Twitter and tell me about it. I hope the above vocabulary assists you in your relationship with money (even though the theory wasn't originally created to be associated with finances). Before we move on, I'd like to point out that if you study the theory long enough, you will notice many different elements of the theory can be emphasized depending on who is presenting it. I like to be upfront about how I tend to emphasize mental health, environmental influences, and creativity because they are of interest to me. My own interpretation of the theory stems from the direct quotes of many authors who also interpreted the theory and emphasized what was of use to them. In addition, my own interpretation stems from my own life experience - the way it would for anyone discussing it. Like any psychological theory, it is merely a lens for exploring the world. We’ll look for facts, we’ll look for truth, and feel free to disagree or add interesting comments. Let's start with level one. Thank you for stopping by the blog! Glad you enjoyed it.